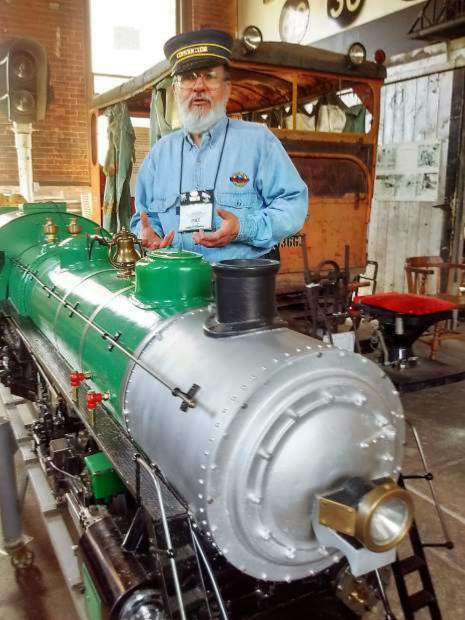 Pat Thrasher, manager of the Glenwood Railroad Museum, has joined Garfield County's other historical societies to propose a property tax on the Nov. 7 ballot. The historical societies and museums hope to see stable funding from the tax proposal, and some organizations, like the railroad museum, don't think they'll stay open without it. Garfield County’s historical societies say a proposed tax increase is their last shot at sustainable funding that will safeguard their futures. On the Nov. 7 ballot, seven of the county’s historical societies and museums are asking voters to approve a property tax increase that would generate an estimated $1 million a year — without which, some organizations wonder if they’ll stay open. The combined operating budgets of these seven historical societies is currently about $250,000. Advocates estimate that the increase would cost residential property owners about $3.24 per $100,000 of assessed property value. “I really do think that’s spare change for most people,” said Rob Anderson, Glenwood Springs Historical Society president. Details are sparse about exactly how that money would be split between the seven historical societies. “I think the first thing is to get the money, then we figure out the organization,” said Anderson. Anderson said that this money would not necessarily be split seven ways each year, but rather an advisory board would prioritize which historical societies have the greatest need. If one museum has a roof falling in, it will take priority over other needs of the historical societies, he gave as an example. Advocates for the tax increase have also said that the money could be used to give each of the historical societies one full-time employee. Currently, if you put all their part-time employees together, they would equal one full-time equivalent employee. But that would mean doling out some of that revenue equally, and Anderson said that hasn’t been settled either. These nonprofits’ normal revenue from membership fees, grants and donations hasn’t been enough. Some are housed in buildings in serious need of upgrades, and others foresee having to close their doors without the tax dollars. The Glenwood Railroad Museum is in particular peril, as the owner of its building, Union Pacific Railroad, is looking to dramatically increase the museum’s rent. Patrick Thrasher, manager of the railroad museum, wrote to the Post Independent that Union Pacific intends to terminate the museum’s lease if the ballot measure fails. Mount Sopris Historical Society in Carbondale is operating on a month-by-month basis, said Executive Director Beth White. And like many other historical societies in Garfield County, Mount Sopris Historical Society doesn’t have set hours, but opens upon request. If the tax proposal is passed, it “would provide sustainability over a 10-year period. With those resources we can build a foundation to stay open for another 20 years,” said White. If passed, the museum tax would start in 2018 and sunset in 2027. Other nearby communities, such as Pitkin County, boast top-notch museums supported with public money, said Anderson. A difference in Garfield County will be that the historical societies are seven separate organizations instead of one. Anderson, in a meeting with the Post Independent, left open the possibility of closing underperforming historical societies and consolidating that operation under a centralized organization. If the measure passes, then phase two will be to go to a higher organizational level, he said. “We have to walk before we can run,” he said. Supporters of the museum tax say that Garfield County has a big economic opportunity in “heritage tourism,” which the museum tax would help it tap into and generate revenue for businesses and sales tax for municipalities. Anderson and other advocates for the tax estimate that it could generate another $1 million in the local economy. This proposal would also create a county advisory board that would formulate how the money is to be spent and make recommendations to the county commissioners, who would have the final say. Even the Garfield County commissioners, typically strict anti-tax conservatives, have voiced support for the museum tax, though the board did not endorse it in putting it on the ballot. Commissioner John Martin, who has not supported a tax increase in his 21 years on the board, praised the initiative as the first tax proposal that he can get behind. The vote on the museum tax could also act as a tax proposal thermometer. Commissioners have recommended that other districts looking for ways to generate new revenue, such at the Garfield County Library District, watch the vote on the museum tax to get a sense of the voters’ temperament toward new taxes. Commissioner Tom Jankovsky said that it might have been better to wait another year for this tax proposal, but advocates with the historical societies have said they can’t wait that long. Commissioners had also been pushing the historical societies to instead pursue a special district. But advocates for the proposal believed that a special taxing district would have been a bigger ask of voters, and they believe voters will look more favorably on a tax the commissioners oversee. However, if the museum tax proposal is successful, the historical societies may look to form a special district in the long-term.